Marine engines are often operated in harsh, saltwater environments that are much more demanding than the conditions faced by most automotive engines. Accordingly, their engine oil must be up to the task. Pro Star Super Premium Synthetic Blend 4 Stroke Oil Premium, synthetic blend engine oil designed for 4 stroke high performance outboards, gasoline inboards and stern drives. 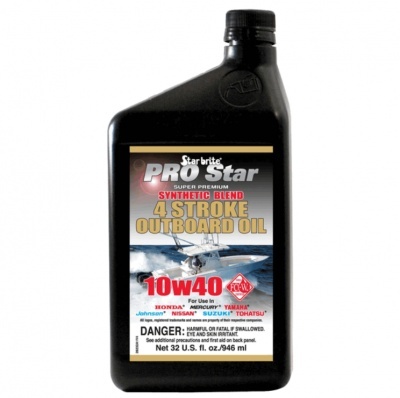 One of the first 4 stroke oils to be certified under NMMA’s new FC-W category. Meets or exceeds all criteria for viscosity, filter plugging, foaming and aeration. Successfully passed NMMA’s 100-hour general performance engine test. Surpasses API requirements for SJ, CF-4 and CH-4. Premium, synthetic blend engine oil designed for 4 stroke high-performance outboards, gasoline inboards and stern drives. Shear-stable polymer additives plus synthetic base stocks maintain proper viscosity under extremely harsh marine conditions. Synthetic/organic blend assures excellent low-temperature properties for quicker starts. Provides maximum protection in severe, high rpm applications. Marine engines typically operate at higher rpms than automotive engines, requiring an oil that is specifically designed and formulated to provide protection under these higher temperature, higher stress circumstances.